The brown recluse spider, also known as the fiddleback spider due to the marking on its back which resembles a violin, is a spider with a venomous bite. The spiders are typically light to medium brown in color and are typically found in southeastern Nebraska, southern Iowa, Illinois, and Indiana, southwestern Ohio, central Texas, western Georgia, eastern Tennessee, and into Kentucky. The spiders can easily be relocated into other states, but successful colonization in these other states has yet to be seen. Brown recluse spiders do not use their webs to catch food instead the male and female will leave their webs to hunt at night. The males will hunt further from the web than the females, and they will hunt for crickets, cockroaches, and other soft bodied insects. Like it says in their name, the brown recluse spiders tend to shy away from people. They favor dark isolated places such as wood piles, sheds, garages, attics, and cellars. When dwelling inside residences, they prefer cardboard boxes, but it’s not unheard of to find them in shoes, work gloves, dressers, clothes stacked or piled on the floor, behind baseboards and picture frames, beds, and even in toilets. Contact with people often occurs when these isolated places are disturbed and the spider feels threatened, such as when cleaning out a closet or the garage. Within the first few minutes of a brown recluse bite an itching/burning sensation will begin. Over the next 6 to 8 hours, the enzymes in the venom will kill tissue and cause the immune system to respond. There will be intense pain and itching at the bite site, as well as swelling, blistering, or the formation of puss. The bite will have a bulls-eye appearance, and there will be a bright red dot surrounded by a wide ring of grayish or yellow skin. The severity of the bite will determine on how much venom the spider has administered to its victim. The spider may have just used its venom on something else, therefore, depleting its venom supply, or maybe the victim was bit by a juvenile brown recluse. A juvenile will not have as much venom as an adult brown recluse. This person received less venom. This person received more venom. There are several pesticides available for spider control, however, brown recluses have perched legs which allow them to walk over most pesticides making them ineffective. 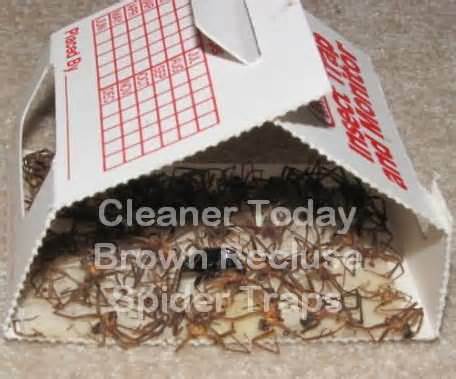 Sticky traps placed along baseboards offer a way to trap spiders and provide an idea of population levels in the residence or garage. Remove all woodpiles and other debris away from the residence. Replace cardboard boxes with plastic containers with air tight lids. Move furniture and beds away from walls, remove bed skirting or ruffles that drag the floor, and remove any items stored beneath the beds. Keep all clothing and shoes picked up and shake out any clothing, shoes, or work gloves that have not been worn in awhile. Use sticky traps along the baseboards since pesticides are ineffective. Vacuum and dust more often. Sometimes other infections are misdiagnosed as brown recluse bites. There are a number of documented infections that produce similar wounds such as Staphylococcus, Streptococcus, herpes, diabetic ulcers, fungal infections, chemical burns, toxicondendron dermatitis, squamous cell carcinoma, vasculitis, syphilis, toxic epidural necrosis, sporotrichosis, and Lyme disease. The most important of these is Staphylococcus, a bacteria that causes wounds very similar to those of brown recluse bites and can be deadly if not treated. 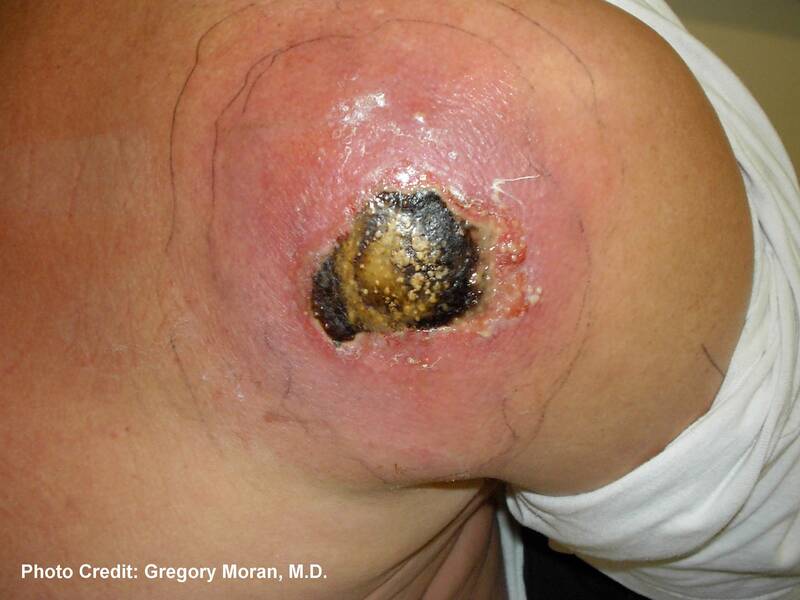 The picture below is of a person infected with Staphylococcus, and you can see the similarity between Staphylococcus and a brown recluse bite. Hi this is Terri Borman childcare specialist and author of Shapes Go to School. I provide quality care and education to children under the age of 5. I have had parents show me bites the children had gotten the night before during their sleep. Thankfully, none of the children have been bit from the naughty brown recluse spider. If these spider bites are on the rise, then I want to send out a warning. Shapes Go to School is a book that teaches children shapes and colors. Its colorful illustrations and classroom setting will entertain and educate your children. They will ask to read it over and over. If you would like to purchase a copy of Shapes Go to School, click on the picture of the book cover. This entry was posted in Uncategorized and tagged brown recluse spider, poisonous, spider bites on August 5, 2014 by terriborman.